National brands expected to increase local advertising investments from $61 billion in 2016 to $74 billion by 2021. This trend of moving marketing focus from national to local mirrors what Vya has been observing with our franchise clients. Franchise brands are shifting their marketing spend from an over-investment in national-level campaigns to an increased emphasis on local, according to BIA/Kelsey’s new “Franchisee Advertising and Marketing Research Report,” now available for download, courtesy of Vya. In the report, BIA/Kelsey forecasts national brands will increase their local advertising investments from $61 billion in 2016 to $74 billion by 2021. The report, which features data from BIA/Kelsey’s annual Local Commerce Monitor™ (LCM) survey of small and medium businesses (SMBs), focuses on the responses from SMBs that are set up as a franchisee or licensee of a national company. The report aims to provide metrics and insights into franchisee advertising and marketing spending, practices, attitudes, and expectations. Franchisee advertising spending plans: 77 percent of SMB franchisee decision makers plan to increase their advertising budgets over the next 12 months. Another 19.6 percent will at least maintain current spending while only 3.5 percent plan to decrease ad spending. Demand for cross-channel performance analytics: There is growing evidence that investment in traditional media combined with digital media advertising provides greater overall lift. However, this effect is not visible to most franchisees. Therefore, franchisors and their franchisees need to better understand how traditional and digital channels perform in integrated campaigns. One of the challenges is finding a common metric for tracking cross-channel performance. Request for more franchisor support for marketing data needs: Compared with last year’s survey, the biggest changes in types of franchisor support requested by franchisees included a desire for more support with “performance analytics” (nearly tripling from 10.9 percent to 29.8 percent) and a doubling of demand for “more benchmarking data on performance of other franchisees” (from 10.9 percent to 21.0 percent). 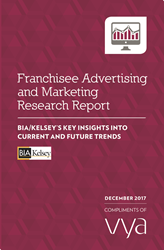 BIA/Kelsey’s Franchise Advertising and Marketing Research Report provides essential insights into franchisee local marketing trends. Download the full report for free, courtesy of Vya: https://hubs.ly/H09LGZ90.